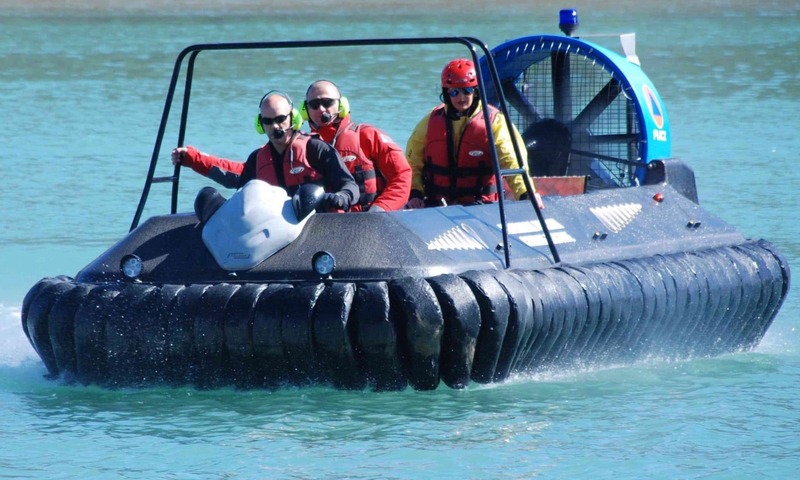 Commercial Hovercraft – Hovercraft are all-terrain vehicles, and can fly during periods such as low tide when boats and ATVs cannot operate so they can be great time and money savers for a wide range of commercial applications. As the saying goes, time is money, and twice a day, tidal conditions make some areas inaccessible. Hovercraft fly at a height of 8 inches over any flat surface, over concrete, tarmac, sand, mud, ice, water, so river, lake and sea. Since they fly on a cushion of air, they are not pushing water out of the way like a boat, so are quite economical to operate, and are not so affected by fast running water, tidal streams or rapids. Hov Pod supply hovercraft for a wide range of commercial, rental, homeland security and survey applications. The unique Hov Pod hull is manufactured either from High Density Polyethylene or Carbon Fibre. HDPE is far stronger that the traditional glass fibre hull offered for sale by small hobbyist suppliers. Hovercraft are very weight sensitive, so glass fibre hulls tend to be very thin to reduce weight; designers have to decide whether to reduce weight and loose a degree of durability, or supply a hull fit for commercial purpose. HDPE is very durable and buoyant, and easier to modify than glass fibre for attaching options for specific commercial applications, and can be heat welded to repair if damage is sustained. Carbon Fibre is rigid, extremely strong yet very lightweight, ideal for commercial applications that require continual operations. In the past, Hov Pod have supplied hovercraft for bridge maintenance and repair work to provide safety and support in inter-tidal areas. For power-line gas and oil pipelines surveys , for detection of unexploded ordnance (fitted with GPS mapping and magnetometers), for homeland security, drug and people smuggling deterrents. They have been supplied for fish farming, shell fish farming, environmental surveying to take mud samples, to spray insecticides to control mosquito larvae. They have been supplied for Coastguard and police patrol, and to deter illegal fishing and protection of protected fish stocks. Also suitable for rescue operations from flood, mud, sand and to save victims who have fallen through ice – safer than a snow-mobile, better than a boat with easily damaged propeller. Also supplied for mining operations, in tropical and arctic conditions. The most popular model for commercial applications is the Hov Pod SPX TCC + 120HP Turbo capable of carrying up to 4 persons with an on-water payload capability of 325 Kgs or 717 pounds. Hovercraft create a pressure wave when starting on water, so it is crucial to drill down in the specifications to check on-water starting capability – reason being that all hovercraft can carry 50% more weight when starting off on land – some smaller suppliers fudge their specifications and only mention on-land capability. This is the first consideration when choosing a hovercraft for commercial use. Check skirt design and material, select segmented skirt design to minimize replacement costs, in this design different segments allow cheap replacement of one section, rather than the whole skirt. Polyurethane coated nylon skirts are hard wearing and durable, neoprene coated nylon are UV degradable and Hypalon less durable, necessitating frequent replacement. Check safety – is the rotating fan assembly protected front and rear by a fan guard? Fans rotate at over 2000 rpm. Some smaller hovercraft have poor safety designs, with exposed engines, wiring, and hot exhaust systems that wrap around the outside of the craft. Smaller hovercraft compromise safety by removing rear fan guards to get more air through the duct. Doing so allows them to fit under-powered engines – cheaper to buy to make their hovercraft appear more competitively priced. Buy cheap, get cheap. Check ease of use, whether certificated training is available, full engine warranty is provided – some suppliers modify engines to extract more power, thus stressing the engine beyond the leeway factor provided by the engine supplier – thus invalidating the engine supplier’s warranty.